Artist's impression of Hayabusa in proximity to Itokawa's surface. Japan's space agency said it had found a trace of gas Thursday in a capsule thought to contain asteroid dust that was brought back to Earth after a multi-billion-kilometre (mile) space journey. 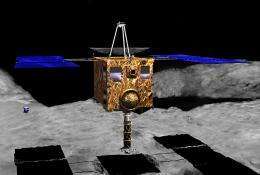 Researchers at the Japan Aerospace Exploration Agency's Sagamihara Campus in Kanagawa began opening the Hayabusa capsule, a process expected to take about a week, JAXA said. Using an optical microscope, they plan to analyse the inside of the container, which was shielded by a Frisbee-sized capsule. Opening the capsule on Thursday, they collected a trace of gas, a JAXA spokeswoman said. "We still don't know exactly what kind of gas it is, but the researchers confirmed a trace of low-pressured gas in the capsule," she said. Scientists hope any dust samples from the ancient asteroid in the capsule could help reveal secrets about the origins of the solar system. "If the capsule contains fragments of at least 10 micron (0.01 millimetre), researchers can make an analysis," the spokeswoman said. But it will take at least a few more months before they determine whether the sample comes from the potato-shaped Itokawa asteroid or not. This photo taken and released on June 14 by the Japan Aerospace Exploration Agency (JAXA) shows JAXA personnel inspecting the capsule carried by the Japanese Hayabusa spacecraft after it parachuted back to land in the Australian Outback. JAXA said it had found a trace of gas in a capsule thought to contain asteroid dust that was brought back to Earth after a multi-billion-kilometre space journey. After a seven-year space odyssey, the heat-proof pod was fired back to Earth by the Hayabusa probe earlier this month after a five billion kilometre (three billion mile) journey. Technical problems plagued Hayabusa, which at one stage spun out of control and lost contact with JAXA for seven weeks, delaying the mission for three years until the asteroid and Earth re-aligned. When it finally latched onto the Itokawa asteroid, a pellet-firing system designed to stir up dust malfunctioned, leaving it unclear how much material the probe was able to gather. Scientists expect to recover at least some asteroid dust from the world-first mission. 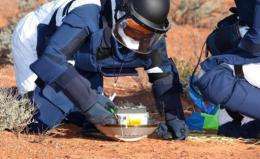 "The surface of the canister is to be cleaned using pure nitrogen gas and carbon dioxide. It will then be placed in the canister opening device. The internal pressure of the canister can be determined by a slight deformation of the canister as the pressure of the environment nitrogen gas in the clean chamber is varied. The nitrogen gas pressure will be adjusted to match the internal canister pressure to prevent the escape of any gas from the sample when the sample canister is opened." Aside from the hypergolic fuel for its thrusters or xenon from the four ion engines, I wonder what the source of this gas may be? Outgassing by the asteroid, while highly unlikely, WOULD be big news. Good points. We'll have to wait and see. Along the lines of an asteroidal source for this unknown gas, perhaps the 'resurfacing' of rubble-pile Near Earth Asteroids comes into play( http://www.physor...615.html ). Maybe the capsule could have a tiny leak, and was not perfectly sealed. Even a microscopic leak in the seal would allow a trace of Earth's atmospheric gas into the container. Don't get me wrong - I hope it IS perfectly sealed and the Japanese have something there. Most likely this will be a non-event as multiple components of common NEOs are gaseous at room temp. Now if it ends up being methane or ethane, that will be extraordinary.